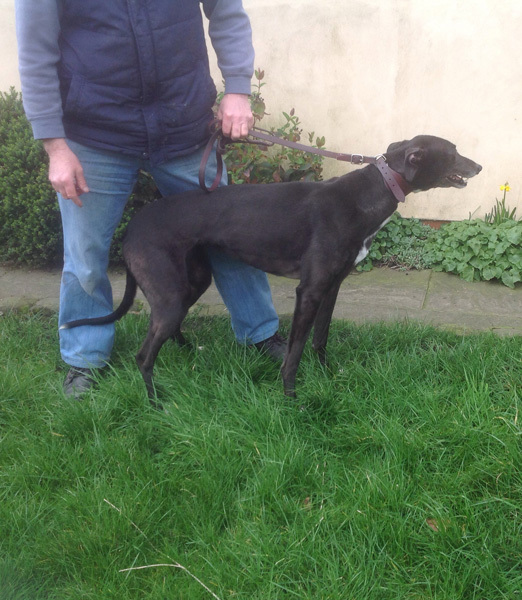 Ebony arrived on Tuesday 15th April 2014. 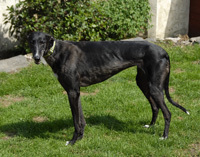 Ebony is a lovely black ex-racing greyhound who was born on the 14th August 2006. She has been with the same owner and trainer since a pup, and she is Beauty and Bess's litter sister. 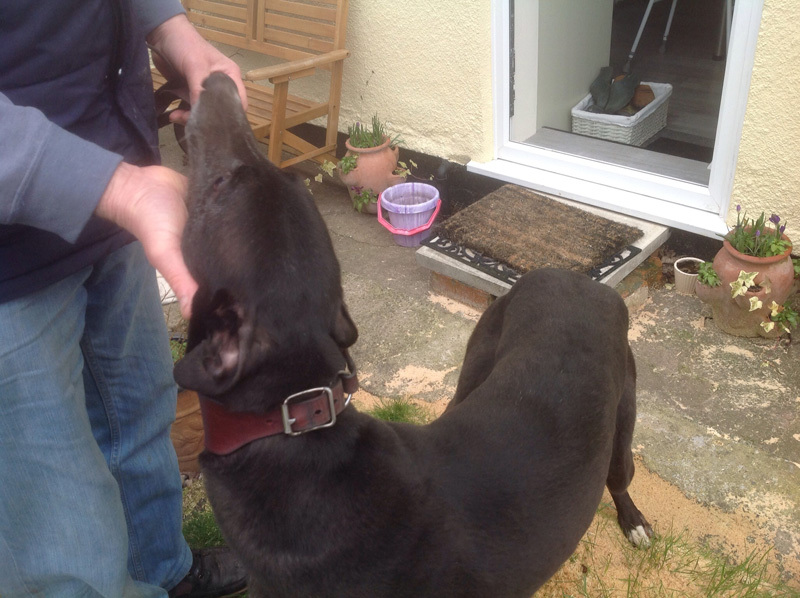 Ebony weighs 25.8k, is house trained, spayed, inoculated and microchipped. She walks nicely on the lead, adores children, is okay with other breeds of dogs and travels well in the car. She is an adorable girl who has a beautiful friendly nature and thrives on love and affection. Ebony has that motherly approach so will sometimes keep the other dogs in check if they push past her, get a bit too playful or rowdy and will give them a grumble (something she's apparently done all her life) to put them in check. 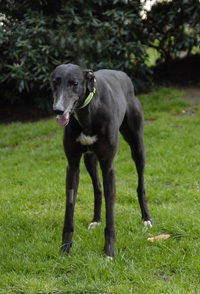 Ebony is an adorable girl who loves looking you in the eye. Went to her new home on Friday 1st August 2014. 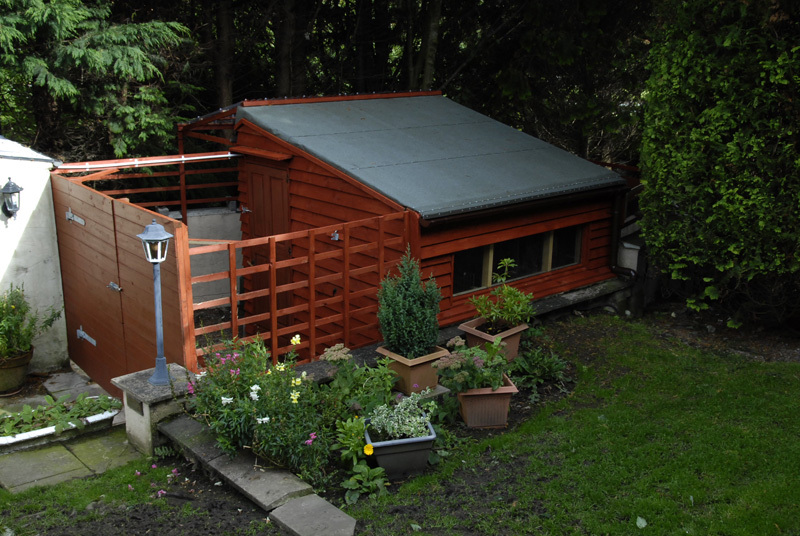 * The branch kennel at the bottom of our garden is where Ebony and the other resident(s) will be for the first day or so until she gets to know the other greyhounds. She has use of our garden and paddock, and once she gets to know the other dogs she will be allowed in the house during the day and all the dogs will then take it in turn to sleep in the house at night, so they become use to sleeping in both the kennel and the house. Ebony arrived this afternoon with her owner, and what a beautiful girl she is. It was an emotional hand over because he'd had her since a puppy and he said that from all the dogs he'd had, she was the loveliest. Hard as it may be to part with her he couldn't deny Ebony the chance of a loving family home life. After she wandered around the garden to explore and do her toilet, then we put her in one of the sections in the kennel so she could greet the others yet not be overwhelmed by them. This morning Ebony went to the vets where she weighed in at 25.8k. She had her first inocuation because she came here with no inoculation details and she was speyed. All went well and we when Stuart collected her in the afternoon she was pleased to see him. When we got her home she was very grumbly towards the other dogs all wanting to sniff around her, which was understandable. To give her some peace and so we could keep an eye on her we put her in the crate in the living room where she slept. In the evening we tried her with some food, which she didn't want then we took her in the garden then put her back in her section of the kennel for the nght. It was a lovely day today so Stuart took photos of all the dogs. We got some lovely ones of Ebony - once she decided to stand still that is! She is just a very happy girl and so full of life, she's a darling. This morning Ebony went to the vet where she had her second inoculation and spaying stitches removed. All was well and she gave me a lovely welcome when she arrived home again. This evening we let the 3 dogs in the kennel sleep in the house for the first time, and so Ebony found herself a bed and went to sleep. During the night I got the fright of my life. I woke around 2.00am, not sure why, so while I was awake I went to the loo. As I was getting back into bed I heard a dog scuffling the big waterproof bed we have in the lounge, so I went to see what was going on and to settle the dog down again. As I came back into the bedroom I saw a face and a foot peeping out from under the wardrobe. It was Ebony. She is only small and somehow she had slid off the bed she was sleeping on and ended up underneath the wardrobe! What a scare, she had woken up, saw me and tried to get out, but she couldn't. Stuart put the big light on and got all the other dogs outside because they were all crowding round to see what was happening, getting in the way and making it difficult for me to get at Ebony. When it was just Ebony and me, I reached under the wardrobe to straighten her leg so it was underneath her and pressed her head and body as flat against the floor as I could. Thankfully the floor was wooden so I was able to drag most of her out, but her hips didn't look as if they would go under the lip on the wardrobe. Stuart was about to get the jack from the car to lift the wardrobe, but instead of pulling Ebony straight I tried twisting her body into a clockwise motion, which altered the way her back end lay and she just, and only just, came out. She was very shaken as she lay there, but we comforted her and her back leg lifted for us to rub her tummy. When I stood she still lay there so I walked away calling her and she jumped up and followed me to be outside with the others, then settled back on a different bed - Sandy had pinched hers and there is no way our big Sandy would slide under the wardrobe. This morning she awoke and greeted us as if nothing had happened. 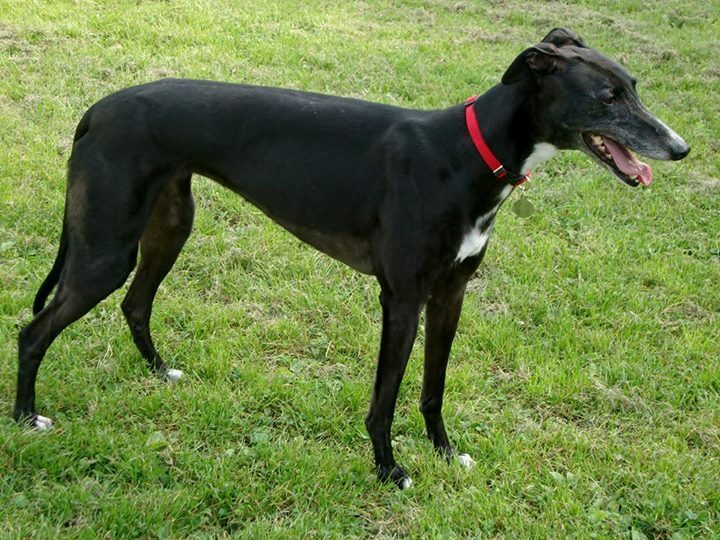 After a little unsettled start with Ebony finding adjusting to living with 9 other greyhounds around, she has now settled, and is much more relaxed and we hope, happier. She has always, as far as we know been kennelled with just 1 other dog, of which she was probably the 'leader', so suddenly finding herself amongst a pack of 9 other dogs with their heirarchy already established put her back a step or two until she found her position and became more content. She is now more settled, her kennel coat is coming off by the handful and she looks a bit 'moth eaten', but she has a lovely shiny black coat coming through underneath. What a beautiful girl she will look once all the old kennel coat has been shed. One of our bed and breakfast guests who walks greyhounds for his local RGT branch likes to walk ours when he stays. This afternoon Ebony went for a walk with him and his two greyhounds. She had a lovely walk and he said she walked lovely on the lead next to one of his dogs. This evening was quiz night in the local pub so we took Ebony and Sandy (who loves the sandwiches they supply at the end!). We went with our guests and their 2 greyhounds. While there our other bed and breakfast guests arrived who also joined us for the quiz (we came 3rd! ), so round our table there were 4 greyhounds, a German Shepherd and a Westie. Ebony, although rather nervous to begin with as it was her first night in a pub soon settled, loved the sandwiches and chips at the end and was perfect with all the dogs. The little Westie walked under her and around her, and she never bothered. Other dogs came in the pub during the evening and again she showed no interest. What a super girl she is. 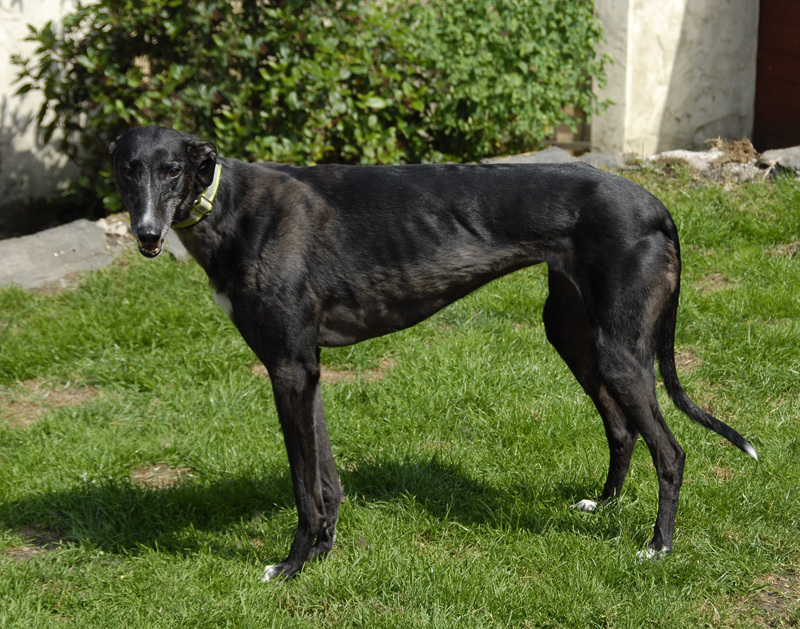 A lady came to visit Ebony this afternoon and asked if she could re-home her so she was reserved until she could be collected. This afternoon Ebony's new owner called to adopt her and take her home. Ebony remembered her and gave her a lovely welcome. Once all the paper work was complete we walked to the car and helped Ebony into the back. As the car drove away Ebony looked back at me then lay down for the journey to her new home, where we hope she will have a long and happy life with her new owner. 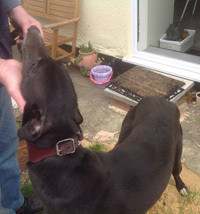 Ebony's new owner said today she couldn't have asked for a nicer dog, she's just wonderful and she loves her to bits. A couple of days after Ebony arrived they were playing in the garden and she pulled her dew claw off, which meant a trip to the vets, but she's okay now. Ebony goes everywhere with her new owner, but the other day she left her on her own in the house with the radio on for a couple of hours while she was at the hair dressers. Ebony was fine and gave her a lovely welcome on her return. 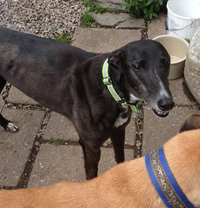 We heard today that Ebony is keeping well, enjoying her walks and the enclosed field she runs in is her dream. She now has two new best friends, a Staffie called Skye and a Golden Labrador called Poppy.